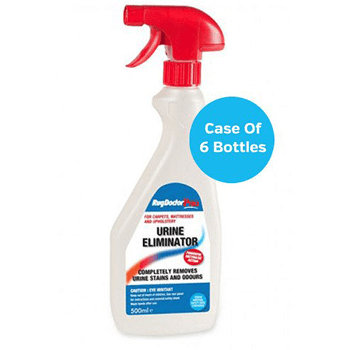 Rug Doctor Pro Urine Eliminator is an ideal solution for urine, vomit and faeces stains and odours. 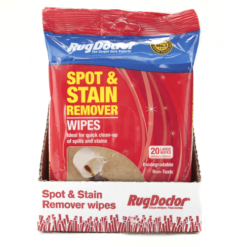 Rug Doctor Pro is great value for money, easy to store and easy to use. Urine, Faeces, Vomit, Blood and Beer Stains and Odours. Uric acid in all urine contains non-soluble salt crystals, which present the biggest challenge to removing urine stains and odours from carpets, mattresses and fabrics. Uric acid crystals are extremely insoluble and remain tightly bonded to the surface. After initial cleaning and drying with ordinary cleaning products, it may look like the problem has been solved. However, any type of moisture on the affected area will reactivate those remaining crystals and the smell returns, as strong as ever. That’s why it’s important to use Rug Doctor Pro Urine Eliminator to get the job done once and for all. 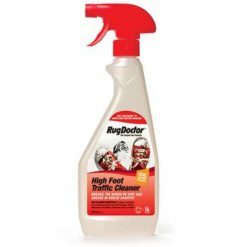 Prior to use: Apply a small amount of Rug Doctor Pro Urine Eliminator to the affected area. After one minute blot using a white, absorbent cloth and check for colour transfer to be sure surface is colour-safe. User assumes all risks. Apply to remove acid based stains such as urine, faeces, vomit, perspiration. 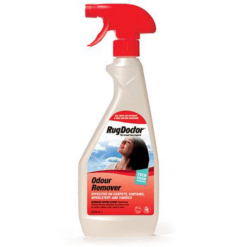 Can be used with or without a Rug Doctor Pro machine. Available in 500ml trigger spray. Directions: When possible, act quickly since urine can sometimes have a bleaching effect on carpets and fabrics. 2. Turn nozzle and generously spray area. If using for urine or other penetrating types of stains, be sure to thoroughly wet area allowing product to reach backing and pad. Do not blot or wipe – enzymes need moisture to work. 3. Place a damp colour-safe towel over the treated area and let dry naturally. In most cases it’s best to allow area to remain moist for 24-hours. Highly contaminated areas may require a second application. 4. Once dry, if discolouration remains, simply dampen with water and blot. 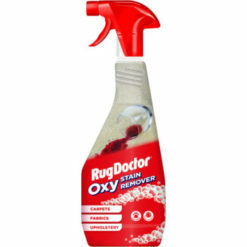 Give your carpets and fabrics the cleaning power and care they deserve with this Rug Doctor Oxy Power Stain Remover.